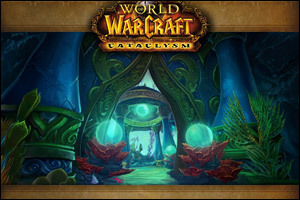 I’m back with another Healing in Cataclysm Installment in which we visit Throne of the Tides. I’ll continue with the boss by boss rundown with any notable trash that you’ve come to expect. A reminder that most of my tips are from the perspective of a druid (my first to 85), but if there is anything in the fight that might be more difficult or easier for another healing class I’ll mention it in my discussion. All gear linked is from normal for easier list compilation. The hallway leading up to the first boss is a gauntlet style fight, so you’ll be moving alot and the large nagas can pack a punch. This first boss fight is a min-Vashj fight if you were around for Burning Crusade. Make sure to be spread out for the Fungal Spores which is removable if someone gets hit. At 66% and 33% health she spawns adds and becomes invulnerable, the adds can pack a mean punch on squishy dps so stay out of the way. The Naz’jar Honor Guard add is a melee mob and the guild groups I’ve run with have had good success with rooting it while the two Naz’jar Tempest Witches are taken care of. The big difference on heroic is that during the part in which she is immune mini waterspouts will spawn on the boss and expand outwards. These must be avoided, if they contact a player, that player becomes ‘stunned’ and is carried to the edge of the room while taking a steady stream of damage. This is a classic Cataclysm boss-fight, avoid the Dark Fissures and keep the party alive. Squeeze does a lot more damage so a debuff tracker to watch for the affected player to add a bit of extra healing here doesn’t hurt. The hallway leading up to this next boss contain Faceless Watchers that pick you up and fling you around followed by a ground smash a la XT in Ulduar. You can cast heals while in the air so use the opportunity to hot the party or get them topped off in preparation for the ground smash. This ground smash can be ranged, so run away from them as soon as you hit the ground. This boss is really a mind controlled quest-giver, so it’s a fight of two-parts. The first part of the fight involves avoiding the Earth Shards when they spike up from the ground. The second part, at 50% health the mob mind controlling him breaks free and then chases after a random party member. When it attaches to someone that party member must be taken down to 50% health (and stay out of their way or they’ll dps you) so you’ll need to top them off once they are released. Neptulon is actually your friend making this is an add based fight with three phases. Phase one has multiple adds in the form of Deep Murloc Invaders, Vicious Mindlashers, and Unyielding Behemoths that you need to prevent from reaching Neptulon. The party will be splitting up to deal with the adds, of which the Unyielding Behemoth will be kited around the room by the tank. A good approach is to just stick near the tank so that any stray adds can be peeled of of the healer quickly. Most of the adds don’t hit too hard so the party should be fine with standard healing tactics. Phase 2 starts with 3 Faceless Sappers spawning and channeling an ability on Neptulon. Your tank will be kiting a new mob, the Blight Beasts, because they cast a stacking aura that deals 2000 shadow damage increases shadow damage taken by 50%. The dps will be running around as a group killing the occasional Unyielding Behemoths and the 3 Faceless Sappers, so it may be easiest to just stick with the pack. After all Mindless Sappers are dead, Phase 3 starts. During phase three you kill Ozzumat, which is the GIANT octopus outside the bubble. He puts a stacking debuff on the party in the form of the black liquid you saw in phase two and must be killed before it kills you all. Just keep the party alive and if you have the mana left throw a dot or smite at the octopus. The first time we did this fight, the third phase confused us because Ozumat is technically outside the bubble. Again nothing significantly different during heroic other than that everything hits harder.